Sydney Sixers 7-136 (Steven Smith 41, Michael Lumb 28, Munaf Patel 2-17) beat Mumbai Indians 8-124 (Dwayne Smith 26, Harbhajan Singh 22*, Pat Cummins 2-16) by 12 runs. Sydney Sixers continued their supremacy in the Champions League Twenty20 without losing any pool match while clinching their last game vs. Mumbai Indians. Sydney Sixers scored 136 runs for the loss of seven wickets after 20 overs and Mumbai Indians settled for 124 with two wickets in hand. Steven Smith (Sydney Sixers) was declared ‘Player of the match’ for his responsible innings of 41 runs at the critical stage of the game. The final pool match of Group B in the Champions League Twenty 20 was played on Monday, October 22, 2012, at Kingsmead, Durban. Earlier, Brad Haddin, the captain of Sydney Sixers, won the toss and sent in Michael Lumb and Peter Nevill to initiate the innings. Lumb started off well by getting 3 fours in the first two overs and added another eight runs in the fourth over. His little crunchy innings concluded when he was caught by Steven Smith at deep midwicket off Lasith Malinga for 28 from 22 balls. The first wicket provided a reasonable stand of 33 runs in 4.4 overs as seven runs later, Nevill was also gone for five runs and Sydney Sixers found themselves in trouble at 3-40 in 5.3 overs. Nic Maddinson and Steven Smith took their team out of complication with a dedicated batting. Maddinson opted for attack and gathered 12 runs in the 9th over with 1 six and 1 four as Smith secured his end while adding a few runs. The pair took the score to 76 in 10.5 overs as Nic Maddinson ran himself out for 27 off just 13 deliveries with 2 sixes and even fours. The Mumbai Indian bowlers once again took control of the game as the wickets started sliding and Steven Smith became the seventh victim at his personal feat of 41 from even balls with 3 fours. Nathan McCullum played a perky unbeaten knock of 20 off 12 balls as Sydney Sixes reached 7-136 in 20 overs. Munaf Patel and Lasith Malinga shared two wickets each whereas Thisara Perera and Harbhajan Singh claimed one wicket each. The Mumbai Indians gave a solid reply as their openers, Dwayne Smith and Sachin Tendulkar got off to a nice start. They managed 20 runs in the first five overs as the little master, Tendulkar, sent the ball out of the fence twice in the next over and both batsmen tasted one six each in the next couple of overs. Moises Henriques struck twice in the 9th over and got rid of both openers in no time. Dwayne Smith was caught by Nevill at long on for 26 and Sachin Tendulkar was clean bowled for 22 runs. Rohit Sharma and Dinesh Karthik steadied the inning for a while and added a few useful runs but both of them were run out at a critical stage of the match for 16 and 18 runs respectively. 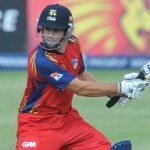 The middle order batting collapsed and the next three batsmen were unable to touch the double figures. Mumbai Indians were reeling at 7-102 after 18 overs when their skipper, Harbhajan Singh, was left alone to face the music. They required 35 runs to win the match in the last 12 balls as Pat Cummins gave away just two runs in the 19th over. Harbhajan Singh penalized Mitchell Starc for 20 runs with 1 six and 3 fours in the last over but that was too late for recovery. He was at the crease with 22 as Mumbai Indians reached 8-124 in the required 20 overs. 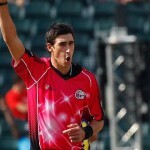 Mitchell Starc, Pat Cummins and Moises Henriques were the only wicket takers with two wickets each. 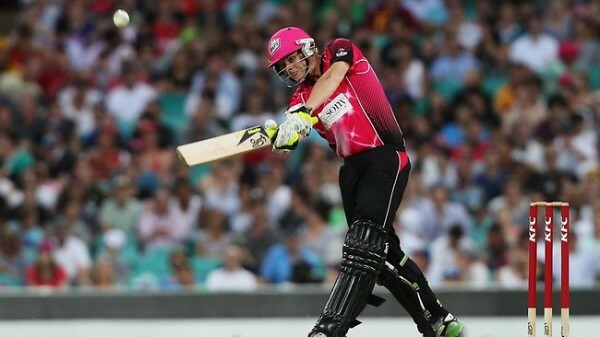 Sydney Sixers won the match in a commanding way by 12 runs and kept their unbeatable record in the tournament. They are leading the table with 16 points from four games at a net run rate of +1.656 and are just two wins away from lifting the trophy.